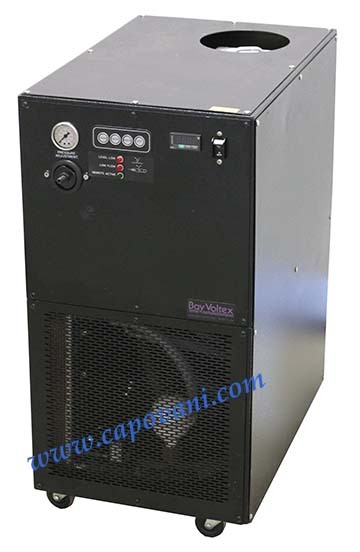 In addition to this Bay Voltex HRE200-E1-H2-F1-D3, Capovani Brothers Inc stocks a wide range of used heating and cooling equipment, including bath/circulators, baths, chillers, heat exchangers, heating circulators, and immersion coolers. Typical manufacturers include Advanced Thermal Sciences, Affinity/Lydall, Bay Voltex, Cole Parmer, Fisher Scientific, Haake, Hart Scientific, Lauda, Neslab, PolyScience and VWR Scientific. Accessories Remote on/off , PD-1 Stainless pump. Other Information UL,CE,&RoHS listed electical components. 20,000 watts @ 5c. 1.3 gallon poly tank with 3" fill port.